Home / TALK OF THE TOWN / Robert Sheehan, Hugo Weaving & Stephen Lang: The Men of "Mortal Engines"
Robert Sheehan, Hugo Weaving & Stephen Lang: The Men of "Mortal Engines"
The filmmakers behind the big-screen adaptation of Philip Reeve's bestselling Mortal Engines novel may have preferred casting relative newbies for the biggest female characters, but for the following roles, they went with veterans Hugo Weaving (who worked with co-screenwriters Peter Jackson, Philippa Boyen, and Fran Walsh on The Lord of the Rings and The Hobbit trilogies) and Stephen Lang (Avatar and Don't Breathe), and fan favorite Robert Sheehan (Misfits, Fortitude, upcoming TV adaptation of The Umbrella Academy). Below, the actors talk about how they prepared for their characters in Mortal Engines’ unique dystopian world, and why they love playing them. But Tom’s world is soon turned upside down and his fundamental beliefs about London—and who within it can be trusted—are tested, when he meets Hester Shaw (Hera Hilmar) and finds himself on the run with her outside the protective fortress of the city. 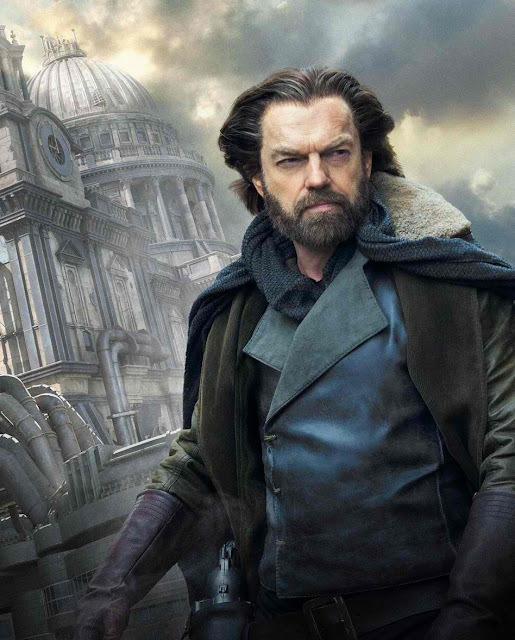 For the role of the dashing Thaddeus Valentine, the team turned to an actor they knew exceedingly well: Hugo Weaving. One of the most compelling characters in the Mortal Engines universe is the part-human, part-automata, Shrike. Hundreds of years old, Shrike is the last known “Stalker” roaming the Earth -- a dead man resurrected by technology. Although Shrike would appear as a digital character on screen, the filmmakers knew that finding the perfect person to perform the role via performance-capture was crucial. And they found that actor in Stephen Lang, who had rocketed to global acclaim in Avatar, and dazzled the filmmakers with his terrifying but empathetic performance in the thriller Don’t Breathe.